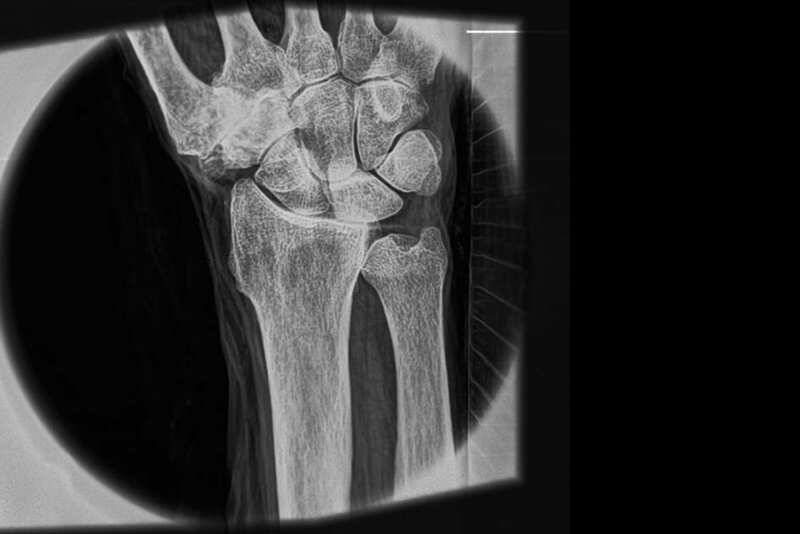 X-rays transformed medicine a century ago by providing a noninvasive way to detect internal structures in the body. Still, they have limitations: X-rays cannot image the body’s soft tissues, except with the use of contrast-enhancing agents that must be swallowed or injected, and their resolution is limited. But a new approach developed by researchers at MIT and Massachusetts General Hospital (MGH) could dramatically change that, enabling the most detailed images ever — including clear views of soft tissue without any need for contrast agents. The work will be presented by MIT postdoc Shuo Chen at the 13th International Workshop on Micro and Nanotechnology for Power Generation and Energy Conversion Applications (PowerMEMS 2013), being held Dec. 3 to 6 in London. The new technology “could make X-rays ubiquitous, because of its higher resolution, the fact that the dose would be smaller and the hardware smaller, cheaper, and more capable than current X-rays,” says Luis Velásquez-García, a principal research scientist at MIT’s Microsystems Technology Laboratories and senior author of the PowerMEMS paper. The key is to produce coherent beams of X-rays from an array of micron-sized point sources, instead of a spread from a single, large point as in conventional systems, Velásquez-García explains. The team’s approach includes developing hardware that is an innovative application of batch microfabrication processes used to make microchips for computers and electronic devices. Using these methods — alternating between depositing layers of material and selectively etching the material away — the MIT researchers have produced a nanostructured surface with an array of tiny tips, each of which can emit a beam of electrons. These, in turn, pass through a microstructured plate that emits a beam of X-rays. The resulting coherent beam of X-rays from the optimized cathode chip would be equivalent to something that can now be produced only by “incredibly expensive” systems at linear particle accelerators, Velásquez-García says. But those facilities have demonstrated the diagnostic power of the images they can produce — for example, clearly revealing the presence of a cancerous tumor by showing the details of the blood vessels supplying it. Similarly, an image of a knee reveals all the ligaments, muscle attachments, and fine details of the bone structures that cannot be seen at all on conventional X-rays. “You can’t have a linear accelerator in every hospital,” Velásquez-García says. But the new system could potentially improve the resolution of X-ray imagery by a factor of 100 with hardware that costs orders of magnitude less, he says. April 17, 2019 - Nastel Technologies Announces New Product Launch, XRay for MQ Virtual-Strategy Magazine"We are thrilled to be adding XRay to Nastel's ever growing suite of products. As we start to shift into taking leadership of the AIOps market we are focused on. April 3, 2019 - Grant will upgrade x-ray technology Rapid City JournalA nearly half-million dollar grant will replace three pieces of technology at the Chadron Community Hospital in the next few months. March 24, 2019 - Everything You Need to Know About the X-Ray and Its Accidental History Interesting EngineeringJust like penicillin and super glue, the X-ray was discovered by accident. Here is everything you need to know.